Soft, safe and now Official-League size! Love these footballs!they are sturdy enough to play with but soft enough that kids can take a hit and still keep going. 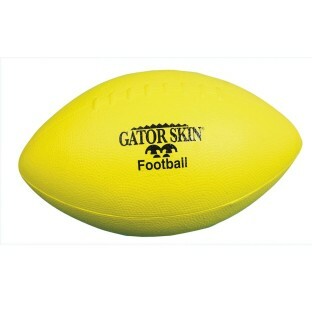 Students love using Gatorskin Footballs! we wanted to use this football to replace the more traditional footballs as they are thrown in the gym our concern being that kids would get hit and hurt with a traditional football. We were hoping this would a good replacement.The good news- it looks good and held up to the use that we put it through.The bad news- it doesn't fly well and kids actually gave up using them. Merchant response: Thank you for your review. We are working with our supplier to improve the quality of this item. The Customer has been provided a refund on this purchase. The slick surface makes it difficult for kids to catch. The kids love kicking it around though. Okay product. The footballs are lightweight soft and easy to handle - great for younger students. The only downfall is after a year or so with a lot of use the outer covering starts to come off.